The Royal Shakespeare Company bring their version of Death of a Salesman to the Noel Coward Theatre following a sell-out run in Stratford Upon-Avon. Directed by Gregory Doran, Arthur Miller’s classic play is revived in the West End for a limited run between the 9th May and the 18th July 2015. Death of a Salesman is considered to be one of the finest pieces of American writing of all time and summarises the demise of the American Dream. The show tells the tale of Willy Loman, an ageing salesman who dreams of a life in which he became a successful business man. 63 year-old Willy regularly talks of imaginary past events as if they were real. Willy lives with his passive wife, Linda and his two sons Biff and Happy. Whilst second child, Happy, is pretty much ignored, Willy has high hopes for his eldest son Biff and expects him to follow in his footsteps as a businessman. However Willy is frustrated that Biff is not as success like his neighbour Charley’s son, Bernard. Antony Sher stars as Willy Loman, Harriet Walter as his wife Linda, Alex Hassell as his son Biff and Sam Marks as his youngest son Happy. Further casting includes Joshua Richards as Charley, Brodie Ross as Bernard, Guy Paul as Uncle Ben, Miranda Nolan as Letta, Ross Green as Stanley, Helen Grady as Jenny, Tobias Beer as Howard Wagner, Paul Birchard as Old Waiter, Emma King as Miss Forsyth and Sarah parks as The Woman. Alongside Doran as Director, Stephen Brimson Lewis provides designs, Tim Mitchell lighting, Paul Englishby music and Jonathan Ruddick sound. 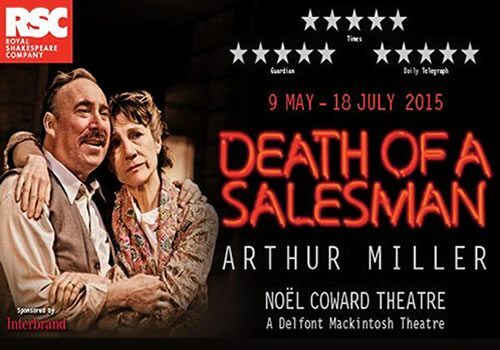 Book Death of a Salesman tickets for the limited West End run now! Death of a Salesman is not suitable for young children. Teenagers accompanied by an adult may enjoy the show, which is considered to be a great literary work.